What were the technological changes necessary to sustain the new sedentary, agricultural mode of life? What were the cultural changes necessary? What are some of the advantages of economic specialization? Why did it begin to occur shortly after agriculture emerged as a way of life? 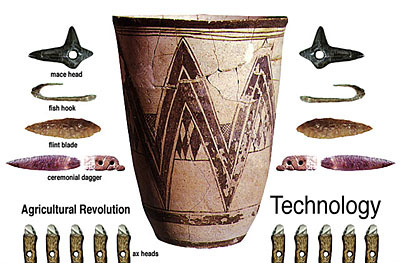 Surprisingly, this dramatically new way of life was not very dependent on new technology. 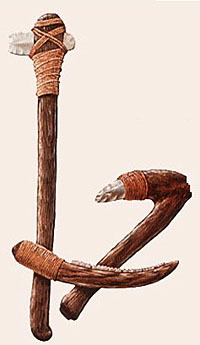 On the contrary, in the earliest phase of development, pioneer farmers used techniques and tools which had long been familiar to hunter-gatherers: the stone axe, hoe, and sickle (left) for preparation of the fields and harvesting the grain. The primitive milling device for grinding seeds between two stones (the "quern," below) to process the grain into edible form had been in use for thousands of years by peoples who collected seeds but did not plant them. Profound cultural rather than technological changes were necessary at first to permit adaptation to the new mode of life. But once the shift had occurred, ever more changes, both cultural and technological, became possible.